The World’s leading manufacturer of rugged and enterprise-grade mobile computing products, the Zebra company (NASDAQ: ZBRA), has recognized Sygic as its Premier ISV partner. 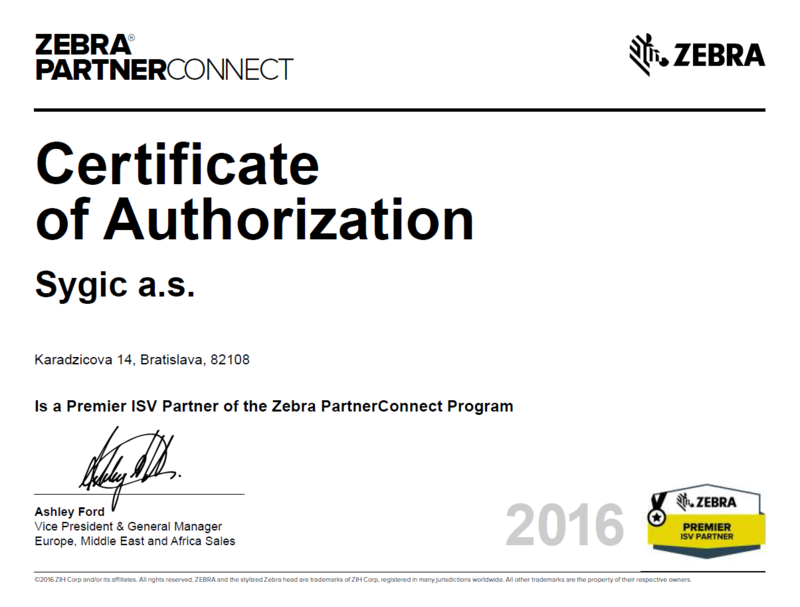 The status of Premier ISV Partner indicates the highest possible tier within the Zebra partner program for companies that develop and market software applications that run on Zebra hardware. The Zebra ISV partner program is designed to reward ISVs who influence Zebra’s business. “Zebra supplies the world’s leading companies with rugged mobile devices for professional use and the recognition of Sygic’s ability to influence Zebra’s business indicates that Sygic Professional Navigation is a very popular and premium quality GPS navigation software for professional use in the market.” Martin Strigac, Director of Sygic Business Solutions. As a Premier ISV partner, Sygic and Zebra will further expand their cooperation by including Zebra Executive Engagement, Application Testing Services Eligibility and access to pre-release units of major new products for porting, testing and solution validation—which means that Sygic is ready to launch apps the same day as Zebra’s new products hit the market.